My life is one trip to the dog park after another. Can anyone relate? Having two energy-filled puppies means playing hard is required every day, so we alternate between an hour of hard running at the park or an hour and a half walk around our neighborhood. So today’s card is inspired by those daily adventures! 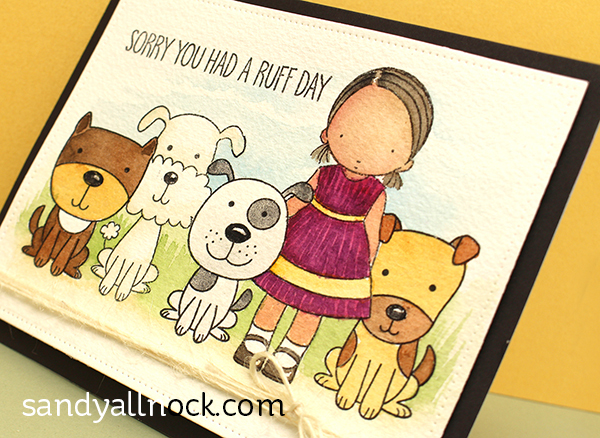 For today’s video I combined two MFT stamp sets to create a little scene; the little girl in the stamp set had a glass of lemonade in her hand, but I masked her hand out behind one of the pups so she could just be standing with all the doggies. Watch the video below or click HERE to see it in HD on YouTube. The card is finished off with a dotted die from Avery Elle and mounted on brown cardstock, with a little twine just for fun. Love the card and the coloring! … and you are such a good mommy to your pups! So sweet, dog park is the happiest place on earth! Such a cute card!! I’ve hesitated watercoloring my dog stamps; just wasn’t sure what colors to use. This will be a great help to me! Thanks, Sandy. Great card. I love the dogs! And I love the dress with the stripes from the little girl. You can better see the colors in the video…so great colors. Greetings to your dogs!!! Very cute! Should have colored her hair red to look like you! Super cute card, I always enjoy your watercolor videos, thanks for all the tips – awesome coloring and love the stripes on the girls dress, nice detail! So cute! 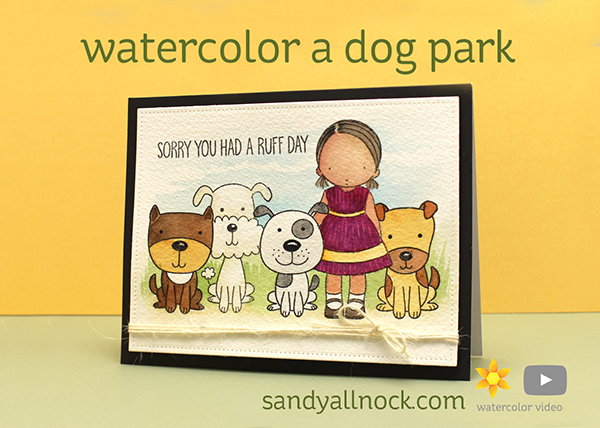 Combine doggies and watercolor and you’ve made my morning!! Thanks for all you do and all of the inspiration you provide. Say hi to those sweet doggies!! Great card. My favs are the pup cards. YES, I can relate to this, not only because of the dogs which I have them but because of the saying. I AM having a really ” Ruff ” day, Thanks for making me smile this morning, you will never know how bad I needed a “doggie” card this morning. Thanks Sandy.